Were desserts not to forget! Separated the belle from her beau! Vowing reunion at the pearly gate! This is what happened to the second half of the mixture I concocted with the leftover Rasmalai milk and hung curd! Mix all the ingredients well. Pour into small moulds or ramekins about ¾ high. Pre-heat the oven to180 C. Arrange the ramekins in a water bath. Start with hot water- not cold. Bake for about 30 minutes or until done. 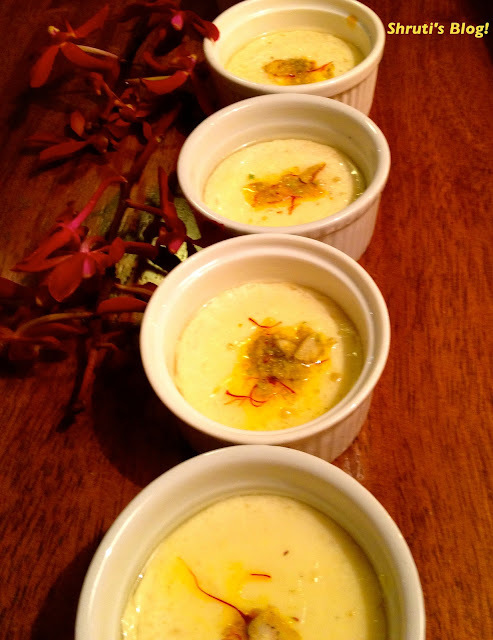 Serve with a garnish of saffron threads and crushed pistas in the ramekins or unmould as cakes in a plate or bowl. You will need to mop up the excess liquid with a kitchen towel. loved the post, the recipe and the pics...I am salivating early morning!!! Thank you Reeta :) !